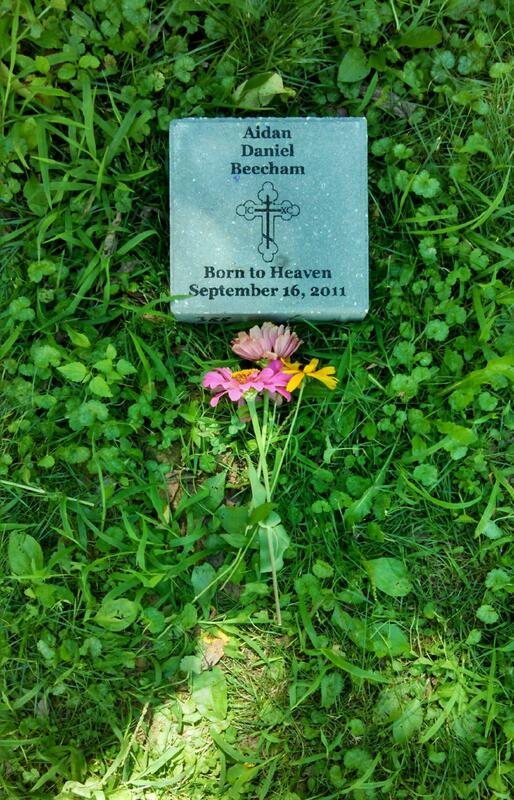 Yesterday, September 16th, 2015 marked the 4th anniversary of the miscarriage and loss of our son, Aidan Daniel. His death at 12 weeks was a devastating blow to my wife and I, for many reasons. First and foremost, his was the first and only pregnancy for us, after, at the time, 9 years of marriage, and trying for children, fertility testing with the diagnosis that nothing was wrong, and no idea why “this isn’t happening for us.” Second, we had just said goodbye 1 year prior to 3 of our Godchildren who’d lived with us for 3 years and brought us joy beyond measure or understanding, making us a family that we will never forget, and bringing out some of the best parts of us as individuals and as a married couple. Finally, with his conception being an unexpected and seeming “miracle” for us, his loss seemed like an immeasurable cruelty, and caused us both to question our faith and belief in the Divine, especially for me more than my dear wife, whose faith runs deep and wide, and I often found myself crying out in both sorrow and anger, raging against the injustice of it all. The days that followed the loss of our son added to an already often physically and emotionally crippling grief that we had been going through since letting go of some of our deepest dreams of a warm home in the country, surrounded by beautiful Indiana countryside, filled with children, and open to family, friends, and strangers alike. Our marriage went through its greatest test to date, and I further descended into a depression and sorrow that I had previously begun to rebound from, with the hope of our own child. This post title is in recognition of something my dear friend Fr. David R. said to me during a conversation after our Godchildren moved home, as well as a memoriam to my son whom I desperately look forward to meeting one day. It also serves as a marker for the anxiety and depression that I struggled with following all of these events, at levels that were previously unknown to me, and gave me a new compassion for others who struggled and continue to struggle with the same things. This is perhaps the best way I have ever heard of describing the feeling of dealing with great loss and grief, as well as recurring bouts of depression and/or anxiety. We humans are, as the Liturgy for Ordinary Radicals puts it, “walking paradoxes; specks of dust AND Divine Image-bearers.” We are made of stern stuff, but also frailer than can be imagined. When hard things befall us, we are often left reeling, wondering what to do next, which road to take, and sometimes even blindly attempting to numb ourselves from the overwhelming pain of walking this mortal coil. However, if we are ever to be healthy again, we must deal with the grief, sorrow, and loss in turn, as each piece presents itself. In Love’s service, only wounded soldiers can serve… Let the shrapnel surface and love and mercy win out in your life, in order to bring solidarity with others who suffer and seek peace themselves, and thus making your own love so much more poignant. If you find yourself spinning downward, shrapnel working its way out, and feeling lost – know that you are not alone. Peace and joy are attainable and if nothing else, you have at least one friend who has already walked this difficult road and brought it Resurrection, and there are others here as well to hold you and sing songs of hope in your ears and hold you while you grieve. Paradise awaits, and therein lies our true Hope – where all sickness, sorrow, and sighing have fled away, and those who have gone before us wait in a place of Light, a place of rest, awaiting our reunion with them on that final day. I am at a loss for words. Your writing is beautiful and has given me quite a bit to think about. Thank you Amy – thanks for reading. It’s great to hear from you. I hope you’re doing well! It’s been a long time! Thanks for your words, Sbdn Luke. May Aidan Daniel’s memory be eternal. I hope I am allowed audience when you meet him. As I sit here with tears streaming, I find myself identifying so greatly with your struggle that you so courageously shared. Anxiety & depression are my forever battles. I can’t even begin to express how deeply your words resonate with me. The words of your dear friend are painfully true. Shrapnel…perfect description. It’s staying the course and allowing yourself to slowly heal day to day. I’ve always had such great respect for you Luke. I also believe sharing is a way to heal and of course to allow others to find commonality and support through tragedy and pain, whatever it may be that allows yourself to be vulnerable and use your past to help heal others. Well I apologize for the lengthy response, I was just very profoundly moved! Bless you and your lovely wife! Thank you for sharing Nicole! I’m grateful the words were helpful, and absolutely agree about sharing. Solidarity sister! Light, joy, and blessings to you and yours! Oh,Luke, that was beautiful. Having gone through a miscarriage myself, your words were exactly how I felt. Peace be with you old friend. Thanks Michelle – peace to you as well!